How can I verify my bandwidth use with my Cooptel high-speed service? From the Cooptel main page, www.cooptel.qc.ca, click on the link “View my consumption”. Please enter your username (ie: username@cooptel.qc.ca, and only enter what is in front of the @cooptel.qc.ca) and your password in the window that will appear on your screen, and click on OK.
Then, select the month for which you want to see your consumption and click on the “View” button. You will then have access to your consumption of the previous twelve months. The username can also be called: User ID, Account name, Login. Do I have to prepare my computer for high-speed internet services? is placed close to a telephone jack for an ADSL connexion (the high-speed modem must be plugged into a telephone jack). Cooptel provides a 6 foot “ethernet” cable to plug the modem to the computer. What is a telephone filter? This equipment prevents the high frequencies of your ADSL high speed modem from producing interference on your telephone line. You must use the filters with your Cooptel ADSL internet connexion to ensure optimum performance. If the filters are not correctly installed, you could hear noise on the line. NOTE : Filters have to be put on each equipment that shares the same telephone line as your ADSL high-speed modem: telephone, fax machine, alarm system, etc. It is important not to put the telephone filter on the socket where you plug in your high-speed modem; this blocks the signal and you will not have access to the high-speed internet service. How can I obtain additional telephone filters? When you buy your modem at Cooptel, we will give you two filters free of charge. To obtain additional filters, please communicate with customer service to make the purchase at the cost of 5$ each. Is the installation of the modem simple? Modem installation guide and configuration guide (service provided on a CoopTel line- DHCP protocol) or configuration guide (service provided on a Bell line- PPPOE protocol). If you require help, our internet technical support team is available to help you from Monday to Friday between 8am and 9pm and on Saturday and Sunday between 9am and 9pm, by telephone or email. What are the names of the mail servers of Cooptel? Cooptel makes available to these members a space of 5 MB on its cooptel.ca site Note, however that you must be familiar with the use of ‘FTP’ and other web page creation tools. You enter your username and your password and you will be able to access your account. For your website to be accessible to everyone, you must add all HTML files to the “public_html” folder. The main page of your website must be saved under the name: index.html. The other pages of your website can have any name you want. How can I quantify the use of data for my current activities? * With 75% emails without attachments and 25% with attachments. ** For information only. Several factors can vary the consumption. 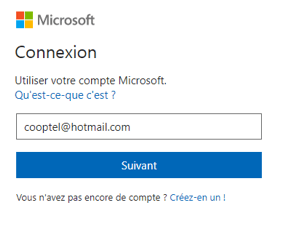 Junk email: How to allow messages from "cooptel.ca" in my Hotmail or Outlook.com email service? Once logged in, click on the “Email Settings” icon and then on “Options” at the top right. Click on “Email; Junk email; Authorized senders “in the left section. Enter “factures@cooptel.ca” in the “Enter Sender or Domain Here” field on the right side, click on the + to add it to the list, then “Save Changes”. Repeat the previous step by authorizing “support@cooptel.qc.ca” and “solutions@cooptel.ca”.